The Humble Store’s annual spring sale is in full effect, offering up serious discounts on thousands of titles spanning a variety of genres. Highlights include The Witness for $19.99 which represents a discount of 50 percent, Batman: Arkham Knight Premium Edition and XCOM 2 at 60 percent off ($15.99 and $23.99, respectively), God Eater 2: Rage Burst for $16.99 (a savings of 66 percent), 75 percent off Prison Architect (yours for $7.49) and half off Dishonored 2, bringing the price down to $29.99. The Humble Store also has multiple publisher sales going on from studios like Bandai Namco, WB Games, 2K Games, THQ Nordic and Frontier Developments, just to name a few. Today’s featured sale, however, is tough to beat. That’s because the store is offering Dungeons 2, a game that normally commands $29.99, absolutely free – no strings attached. Even if it’s not the type of game that you’re typically into, it may be worth a try at zero cost. Just be sure to grab it within the next 20 hours (as of this writing) as the deal expires at that point. Also, if you have any interest in Alan Wake, it’ll be offered at an incredible 90 percent discount starting May 13. The deal will only be good for 48 hours as the game is being pulled from the market at the conclusion of the sale due to a music licensing issue. 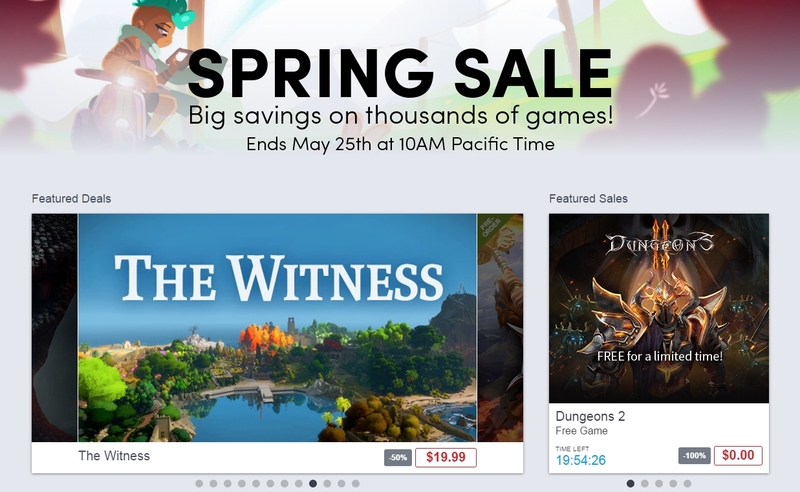 The Humble Store spring sale runs through May 25 at 10 a.m. Pacific.